The Macon one-pipe steam valve assembly consists of the reliable EVO direct mounting thermostat. The thermostatic head contains a temperature sensitive wax which expands and contracts on a rise and fall of temperature in the sensed area. When the temperature rises above the temperature selected, pressure from the expanding wax closes the valve, preventing or restricting the flow of steam through the radiation unit. When the room temperature drops below the selected temperature, the valve opens and allows an increase of steam flow through the radiation unit. This modulating process continues automatically to maintain the temperature you selected. The OPSK controls room temperature by regulating the amount of air and steam in the radiator. Remote thermostats available – call or write for the distributor nearest you! 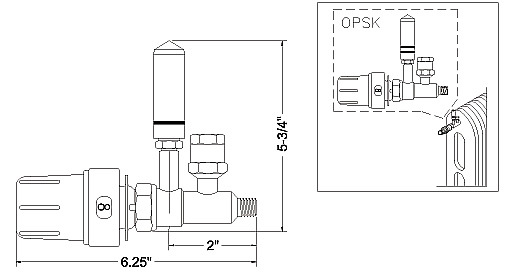 The OPSK helps to minimize large temperature swings inherent in one pipe steam systems. Note: Additional information and installation instructions can be found in Technical & Service Section. Installing the OPSK does not eliminate other controls in the system. The boiler must be cycled in some manner so that condensate can return to the boiler and eliminate boiler flooding. If the boiler is cycled from a space thermostat in one zone, do not apply a radiator valve to that zone’s radiation. Do not apply a radiator valve in a one-pipe steam system that does not use steam air vents venting to the atmosphere on each radiation unit. 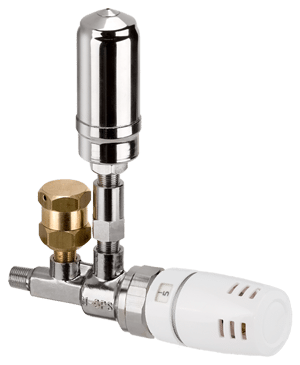 The VB-18 vacuum breaker is recommended and assists in the return of condensate. Integral installation reduces vacuum problems. Very effective with system pressure range 0-1½ PSI. Suggested maximum operating pressure 2 PSI.